Description: THERE'S HOPE FOR THE FUTURE, BUT WHAT ABOUT THE PAST? 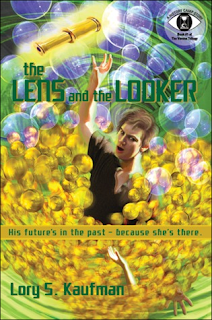 In The Lens and The Looker we have a combination of subplots going on that all weave together to form a remarkable story of love, friendship and responsibility. The book’s description states that there are three main characters; seventeen-year-old Hansum, who becomes Romero, fifteen-year-old Shamira (Carmella) and fourteen-year-old Lincoln (Maruccio). However, the storyline focuses more on Hansum than the others. You learn the most of him and he is the easiest to sympathize with. Plus he is the one with the love interest. Now, before I get into too much detail about the plot, I want to forewarn you that this isn’t a book purely driven by romance. While there is a romance found within, it doesn’t take center stage. If you go into reading The Lens and The Looker hoping for an over the top, historical teen romance, you are going to be disappointed. Now, again, this wasn’t an issue for me, I truly enjoyed what the book had to offer. But if you are solely seeking a romance, keep looking. The majority of the book takes place in 14th century Verona, not the 24th century. It’s a time travel book, but the characters do not hop back and forth throughout history. It wasn’t an issue for me, I truly enjoyed reading about Verona. I have honestly never read a book about Italy during that time, or any other place really, well besides Romeo and Juliet. Although that doesn’t really count, it takes place nearly 200 years later. The magic of this book lies with the wonderful, thoughtful take on 14th Century Verona, and the sort of coming-of-age story of the three teens from the future. Like I stated earlier, I cannot remember ever reading a book that tackled this particular time period before and Kaufman approaches it with such care and gusto. He paints a truly vivid picture of the setting and colorful characters that come with it – He made me want to meet the lens maker, his kooky wife and beautiful daughter. I want to walk the bustling market streets and see the stunning church interiors. However, I could stand without smelling the horse poop and watching the butcher make a living. I much prefer to see the final product all wrapped in plastic at the grocery store. The reader is introduced to the time period and all of its quirks in a very unique and effective way. As the three teenagers are first coming to terms with their surroundings, so are the readers. They react in the same way that I would imagine we all would – which makes the experience and story really come to life. I also found it immensely interesting to see how they struggle to fit into their new life and surroundings. It is exceeding difficult for them because they even have a different way of holding and presenting themselves - they act privileged for the time period. Those they meet certainly find them odd; not only do they speak their minds and boldly look you in the eye, they can read and write. There isn’t a great deal of action within the book, the progression is much more character-oriented. While the plot moves at a steady pace, the characters, their feelings and interactions are primarily what keeps you turning the pages. I only wish that we could have seen more of the story from Shamria's perspective. I thought she was one of the more interesting characters and unfortunately she sort of rides shotgun to the boys. I think her story would be incredibly interesting - a teenage girl going from the 24th century to the 14th. Think of all the status changes that would involve. You would go from being an independent, free-thinking equal to becoming nothing more than a pretty face who is to be seen and not heard. Although Sharmia isn't treated this way by the lensmaker and his family - I believe that was the general consensus at the time. Well, maybe not. I should really go do some research. But you get my point, I would have loved to see her story. Despite a few minor flaws, The Lens and The Looker is both captivating and intelligent. I was swept away with the story, especially with the idea of them rewriting history. I am incredibly eager to see what happens next! I've heard a couple of good things about this one. What really attracts me to it is the dystopian element; otherwise, it might be a story that could easily slide under my radar without me ever noticing. I'm going to have to see if I can get a copy at some point, to give it a try and see if I enjoy it as much as others are.